“We urge the Senate to reject Judge Kavanaugh’s nomination. “Judge Kavanaugh has shown the country that he does not possess fair and unbiased judicial temperament. Indeed, he engaged in unprovoked, partisan attacks, and treated United States Senators—the people conducting his job interview—with shocking disrespect. Senators have the right to ask questions of nominees. In fact, it is their responsibly to ask them on behalf of the American people. “In addition, troubling allegations about his past and misleading if not untruthful testimony before the Senate Judiciary Committee cast further doubt on his judicial credibility. Alexander Hamilton wrote in The Federalist Papers that “all judges who may be appointed by the United States are to hold their offices during good behavior.” That’s not what we saw from Judge Kavanaugh during the confirmation process. The LWV-WV is excited to join with other organizations and individuals committed to moving West Virginia forward as a supporting partner of the 2018 All Kinds Are Welcome Here Civil Liberties Lobby Day on February 8 at the State Capitol in Charleston. Come stand with us in solidarity to show the West Virginia Legislature that West Virginia should be a place that welcomes and respects ALL people! There will be an advocacy training starting at 9 am to make sure you are comfortable talking with your elected officials about issues that matter to you, followed by a large press conference and rally featuring our lawmakers and other members of the community. Following the press conference, attendees will watch a floor session from the House or Senate galleries at 11 am when legislators convene. The afternoon is devoted to meeting with your elected officials. Attendees are encouraged to arrange their own meetings with their legislators, but there will be a table were folks can connect with others from their area to attend meetings as a group. Please register here to let us know which parts of the day you’ll be attending, and which issues matter the most to you. We look forward to seeing you there. Please stop by our table in the lower rotunda. All kinds are welcome and all voices must be heard! Please join us and invite your friends today. Decision on FirstEnergy’s Bad Deal for WV Coming Soon – Speak Out Now! Click here to send a FAX to the PSC. Please take time to personalize the sample letter provided. Please reference Case No. 17-0296-E-PC. The State Board invites you to support this opposition. 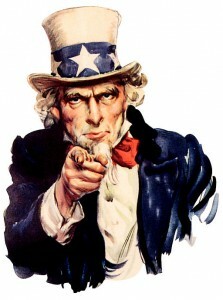 Please sign the petition at http://energyfreedomwv.org/take-action-1-1/, and/or send your own letter to the PSC. Customers should not be forced to pay for a purchase that will raise the costs of their electricity. Furthermore the purchase of the Harrison power plant would lock in costs for many generations, so that better alternatives would be precluded. Once again, we are confronted with a similar situation, this time involving the purchase of the Pleasants Power Station that is currently operating in a deregulated electricity market where it is struggling to compete against less expensive power sources. The League firmly opposes this new attempt by FirstEnergy Corp. to offload this plant to our regulated market because of debt the company has acquired due to its own lack of foresight in the transitioning energy markets. The state of West Virginia is a net exporter of electricity, providing almost 5% of the nation’s total energy, largely because of its coal production. However, many states receiving our electricity from the grid are phasing out coal generated electricity. It is time that West Virginia does the same. Even as this statement is being written, a massive iceberg the size of Delaware is very close to breaking free from Antarctica, due to a huge, widening crack in the 10,000 year-old Larsen ice shelf. The financial costs for West Virginians from climate change will vastly exceed any profits for FirstEnergy Corp. shareholders. Switching the power station’s financial risks from stockholders to ratepayers will not benefit the people of West Virginia, and in the final analysis they will be the net losers. Our Children, Our Future is offering their successful candidate trainings again, and they want to know which days work best for you, and what office(s) you are interested in. Please call Senator Manchin TODAY! You can call his home office in West Virginia at 304-342-5855 or Senator Manchin’s Washington, D.C. office at 202-224-3954. In addition, West Virginians with a 304 or 681 area code can contact Senator Manchin’s office through our toll-free number at 855-275-5737. What Legislation? The U.S. Senate plans to vote this Wednesday, January 20th on H.R. 4038, “The American Security against Foreign Enemies (SAFE) Act,” which would grind to a halt the resettlement of Syrian and Iraqi refugees. This bill was passed by the House of Representatives in November, so it is critical that it does not pass the Senate. Such proposals and the anti-refugee sentiment that has accompanied them are morally reprehensible and go against who we are as a nation. It is critical that Senators hear from their constituents NOW. Urge Manchin to vote NO to H.R. 4038 and any legislation that would stop, pause or defund the resettlement of Syrian and Iraqi refugees. Below are some helpful points on the security checks involved in refugee resettlement, which is the focus of this legislation. The most important points to mention, however, are your story and why your community wants to welcome Syrian refugees. The U.S. government handpicks the refugees who resettle here, and the U.S. resettlement process has the most rigorous screening process in the world. Refugees are the most thoroughly vetted people to come to the United States, undergoing interagency screenings by the Department of Homeland Security, FBI, Department of Defense, National Counter Terrorism Center and multiple intelligence agencies, including biometric checks, forensic document testing, medical tests and in-person interviews. Continuing refugee resettlement while maintaining national security is not an either/or situation. The United States can continue to welcome refugees while also continuing to ensure national security. We can and must do both. The League supports federal immigration law that provides an efficient, expeditious system (with minimal or no backlogs) for legal entry of immigrants into the United States. To complement these goals the League supports federal policies to improve economies, education, job opportunities and living conditions in nations with large emigrating populations. Dear Supporter,Today, the U.S. Supreme Court will hear oral arguments on the constitutionality of the Voting Rights Act (VRA) of 1965, a case which will ultimately decide whether millions of voters could face new barriers when trying to exercise their right to vote. The Voting Rights Act is an essential part of American democracy. It ensures that every American citizen, regardless of race, has an equal right to vote. If the Justices overturn the Voting Rights Act, it would be the single biggest setback for voting rights in history. Join with us in pledging to protect the Voting Rights Act and the right to vote. The VRA is indispensable to the League’s work. The League protects and defends voting rights across the country in order to ensure that our elections are fair, free and accessible to all eligible citizens. The VRA has helped the League work to defeat restrictive state voter photo identification laws, block such laws where they have already been passed, and fight laws designed to curb organizations like ours from registering voters. The thought that the Supreme Court might take away voting rights should send a chill down the spine of every American. We’re working with our partners to ensure that the justices of the Supreme Court understand what is truly at risk if the VRA is overturned – join us and take a stand to support the Voting Rights Act. Rooted in the movement that secured the right to vote for women, the League of Women Voters has always been committed to registering and turning out voters, and we’re not stopping now. The VRA remains critical to ensuring that every American can cast a ballot and have it count. 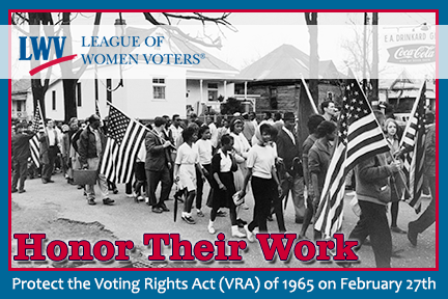 Join us in defending the VRA and ensuring all Americans have the right to vote! Thank you for helping make our democracy work. P.S. This morning, while the oral arguments are taking place inside, we’ll be outside on the steps of the Supreme Court rallying with our partner organizations in support of the Voting Rights Act. Follow us on Twitter for up-to-the-minute updates! For the first time ever, the Environmental Protection Agency (EPA) could put limits on the industrial carbon pollution that fuels global warming, makes smog worse and threatens the health of children and the elderly — and you can help make it happen. Support the EPA’s historic standard to limit carbon pollution. The EPA has taken an important first step by proposing a new standard to limit carbon pollution from new power plants. The agency is now receiving public comments on the proposal and we must add our voice in support. You can bet that corporate polluters are already doing everything they can to block these important health protections. Members of the environmental and health communities are already voicing their support, and we must add the trusted League voice to theirs. Add your voice! Tell the EPA that you support strong protections against industrial carbon pollution. The EPA’s proposal sets a performance standard that will ensure new power plants limit their pollution. But this is just a down payment. Existing coal-fired power plants account for the largest chunk of carbon dioxide pollution emitted by stationary sources in the US, which is roughly on a par with the carbon dioxide pollution emitted by the entire transportation sector. We need to build strong support for the EPA’s proposal on new plants to ensure that there will be political support for taking the next step — controlling carbon pollution from existing power plants! Send a powerful message to let the EPA know you want them to support people not polluters. Your comment will be delivered with those of thousands of League members and supporters across the country. Submit a comment to the EPA today!